The Samsung OfficeServ 7030 is a compact design for small businesses and engineered to deliver a cost effective, easy-to-use and secure IP PABX telecommunications platform for integrated voice, data and wireless communications. Included is a full set of advanced features and sophisticated applications such as Voicemail and Auto Attendant enabling the Samsung OfficeServ 7030 to enhance staff performance and deliver substantial cost savings. The Samsung OfficeServ 7030 is designed for up to 32 users. 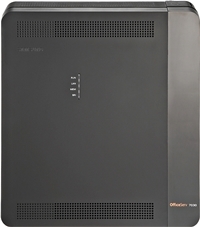 The Samsung OfficeServ 7070 is an IP PABX optimized for small and medium sized businesses. The built-in functions are essential for small and medium-sized businesses such as CID, Auto Attendant and Voicemail. The Samsung OfficeServ 7070 supports 8 VoIP channels without additional equipment and works perfectly with existing communication infrastructures. VoIP reduces communication costs by working together with Internet telephony service providers through the SIP trunk support. An integrated VoIP network can provide seamless collaboration with a remote office. The Samsung OfficeServ 7070 is designed for up to 50 users. The Samsung OfficeServ 7100 IP PABX is designed specifically for the small to medium sized company, supporting up to 32 extensions and a maximum of 30 trunk lines with either analogue or digital connections. It is highly configurable and can be adapted to suit your individual requirements. The Samsung OfficeServ 7100 can be easily upgraded and expanded as business grows and needs change. The Samsung OfficeServ 7100 is designed for up to 32 users. The next generation of IP platform is the Samsung OfficeServ 7200 that provides IP based wired and wireless solution for voice and data telecommunications. Samsung OfficeServ 7200 is the ideal solution for the future and the present office because it can simultaneously support both traditional voice communication, voice over IP (VoIP) based data communication and wireless solutions through Wireless LAN. The Samsung OfficeServ 7100 is designed for up to 100 users. The Samsung OfficeServ 7400 is designed for up to 400 users.